Don’t miss the chance to show off your fabulous work at our annual show at the Alameda County Administration Building. The show is located in well-lit, secure areas with high traffic open to the public during normal working hours, Monday-Friday. This show is highly anticipated by the approximately 6,500 County employees and visitors to the building. It’s a wonderful way to promote quilting and EBHQ! We need up to 30 - 35 pieces (not previously shown at this venue) in a wide range of styles and dimensions. Quilts can be up to 60” in height and of any width. Small and medium quilts are welcome and show very well. 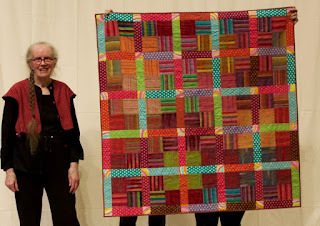 It is possible to show your quilt in both the Alameda County Exhibit and Voices in Cloth. Application and Waiver Forms are on the last two pages of the August newsletter. Deliver quilts at the Education Session on August 28 or September 25, at Drop-Ins on September 12 and 16, or by special arrangements with Kathy Bowden. Deadline to enter: September 25 at the EBHQ Education Session. Installation: October 27, 2017; De-installation: February 23, 2018 Quilts will be returned to you at the Education Session after the date of show closure, or by special arrangement. Questions? Contact Kathy Bowden (925) 885-9144 or ebhqexhibits@gmail.com.